Home > Credit and Store Cards > In Trouble With Credit? Things are getting tight for a lot of people, and when the credit crunch starts to really take effect, there’s a temptation to turn to loan sharks or other ‘easy’ sources of credit to get your hands on ready cash that will be paid back when you’re back on your feet. But will it? The trouble with money lenders like this is that they are not regulated, and they will always lend you money, even if they know full well that you can’t afford to pay it back. They add a sky high rate of interest to any money that you owe them, late payments incur more unreasonable charges, and before you know it you could owe these people more money than you are ever likely to be able to repay. Simply put, a loan shark is anybody who will lend you money without having the correct licence. Lending money without a licence to do so is illegal. On top of being illegal, a loan shark will usually charge very high interest rates – and if you have trouble paying the loan shark back, you could find that their methods of debt recovery are intimidating. With the difficult current financial climate, loan sharks are having a field day with people who get into trouble with legitimate credit, or find themselves out of work. Don’t worry, if you’ve been tempted and have ended up borrowing money from a loan shark, it’s them who have committed the offence and not you. If you’ve been targeted by a loan shark or have borrowed money and are having trouble repaying it, there is a confidential national loan shark hotline you can call for advice and support. Any information you give them also helps them to take action against illegal money lenders.The hotline number is: 0300 555 2222. You can also report a loan shark by email: stoploansharks@birmingham.gov.uk. The first thing to do is go to all your creditors – people you owe money to – and explain your situation. You might find it easier to visit a citizen’s advice bureau and speak to one of their money advisers. They can help you to work out a repayment scheme for all your debts, making sure that the important people are paid first and dividing what’s left over between unsecured creditors such as credit cards, unsecured overdrafts and loans. They can also contact your creditors and make an arrangement for you, although the creditors don’t have to accept the offers that you make. 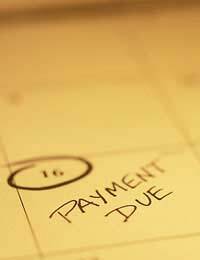 In reality, most companies will prefer you to pay a small amount than default on a credit agreement completely. A credit union is a mutual financial organisation that is owned and run by its own members for the benefit of its members. It used to be that you had to agree to save money with the union (which can be the difficult part if you are already in financial trouble), showing that you were a regular saver, but that is no longer the case. Credit unions using growth fund money, are required - when using this money - to lend without saving being a precondition. Members usually live in the same area, or work for the same organisation, and all credit unions are regulated by the Financial Services Authority.